Clarity™ is an absorbent Kaolin mask created to help clear problem skin prone to blemishes. 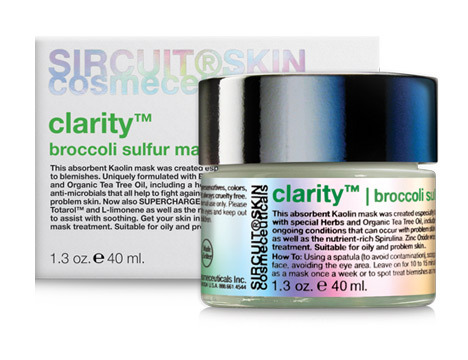 Uniquely formulated with Broccoli and Sulfur, along with special Herbs and Organic Tea Tree Oil, including a host of antioxidants, vitamins and minerals that all help to fight against the ongoing conditions that can occur with problem skin. SUPERCHARGED with a synergistic complex of skin-clearing and nutrient-rich ingredients that help to minimize imperfections, improve texture and assist with soothing. Get your skin in shipshape condition with this multi-tasking mask treatment! Helps to reduce blemishes and helps to decongest pores. Draws out impurities and absorbs excess oil. Help to fight against the ongoing conditions that can occur with problem skin. Soothes and refreshes without over-drying. 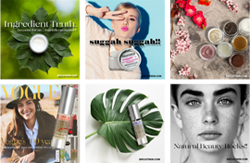 Skin Type: Suitable for oily and problem skin. How To: Using a spatula (to avoid contamination), scoop out a small amount of Clarity™ into the palm of your hand and gently smooth a thin layer over cleansed face, avoiding the eye area. Leave on for 10 to 15 minutes. Gently rinse with warm water ensuring all traces of the mask are removed. Clarity™ may be used as a mask once a week or to spot treat blemishes as needed. For added benefits, follow with a SIRCUIT® treatment serum and moisturizer as part of your home treatment program. Shake well before use. Kaolin: A pure, white clay that helps to absorb sebum from the surface of the skin, thus helping to unclog pores and remove toxins from the skin’s surface layer which leaves the skin feeling soft and smooth. Bentonite: A mineral-rich, natural clay that helps to absorb sebum from the surface of the skin, thus helping to decongest pores and remove toxins from the skin’s surface layer. Zinc Oxide: Offers broad-spectrum, physical protection against damaging UVA and UVB exposure while also known to provide soothing properties that may help to relieve skin discomfort. Broccoli Extract: A soothing, more effective and less drying, form of Sulfur than in most Sulfur masks. Spirulina: A type of blue-green algae that is rich in protein, vitamins, minerals, carotenoids and antioxidants that can help protect skin from environmental damage. Biotin (D): A Chirally Correct form of a Vitamin B7 complex that helps maintain skin moisture levels which contributes to healthy looking skin. Formulated With: Aqua (Water), Glycerin*, Kaolin, Caprylic/Capric Triglyceride, Bentonite, Sulfur, Cetyl Alcohol, Stearic Acid, Glyceryl Ricinoleate, Glyceryl Stearate, Zinc Oxide, Melaleuca Alternifolia (Tea Tree) Leaf Oil*, Brassica Oleracea Italica (Broccoli) Extract, Origanum Majorana Leaf Oil, Mentha Piperita (Peppermint) Oil*, Spirulina Platensis (Phycocyanin-C) Extract, Lavandula Angustifolia (Lavender) Oil*, Chamomilla Recutita (Matricaria) Flower Extract, Passiflora Incarnata (Passionflower) Flower Extract, Calendula Officinalis Flower Extract, Totarol, Tocopheryl Acetate (D-alpha), Helianthus Annuus (Sunflower) Seed Oil, Biotin (D), Squalane, Allantoin, Lonicera Caprifolium (Honeysuckle) Flower Extract, Lonicera Japonica (Honeysuckle) Flower Extract, Gluconolactone, Caprylyl Glycol, Cocamidopropyl Hydroxysultaine, Silica, Hamamelis Virginiana (Witch Hazel) Water, Alcohol Denat. *, Citric Acid, Phenethyl Alcohol, Sodium Benzoate, Potassium Sorbate, Limonene (L). *USDA Certified Organic | NOP. Phthalate-free.